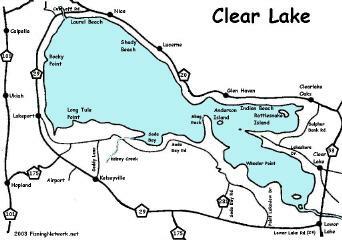 Clear Lake is located in Lake County, approx. 100 miles N. of Sacramento. From Sacramento take I-5 north to Williams. Then E CA-20 to Clear Lake. Clear Lake is one of the largest natural lakes in Califronia. It consists of 43,000 surface acres and over 100 miles of shoreline, set at an elevation of 1,326 ft. There are numerous marinas and 11 public launch ramps located around the lake, most of which are available free of charge. Rental boats are also available. Skiing / Jet-Skiing is allowed. Considered one of the top bass fishing lakes in California. The large abundance of natural forage accounts for a very healthy population. The lake record for largemouth bass here is 17.52 pounds. There are also catfish, crappie, bluegill and carp in the lake. There are many bass tournaments held here as well as annual "Carp-Shoots"
Note: The lake experiences an "algae bloom" twice a year, during spring and late summer months. The algae is part of the natural food chain for this lake. It does however, raise the mercury levels in the fish living here. The California Department of Health Services has advised limiting the amount of fish consumed from here. I was basically raised on Clear Lake, I spent many summers at m&m campground in Clearlake Oaks. Its not uncommon to pull 10-15 catfish of the shore...and the abundance of crappie is great as well...then there are the bass !! wow...I have pulled bass from this lake from 3 to my biggest of 11.6 pounds ( always caught and released ) so in my opinion this is one of the best all around fishing lakes in California. ( also give it a try around rattlesnake island you can kill them in the Tule's ) Its well worth the drive! !